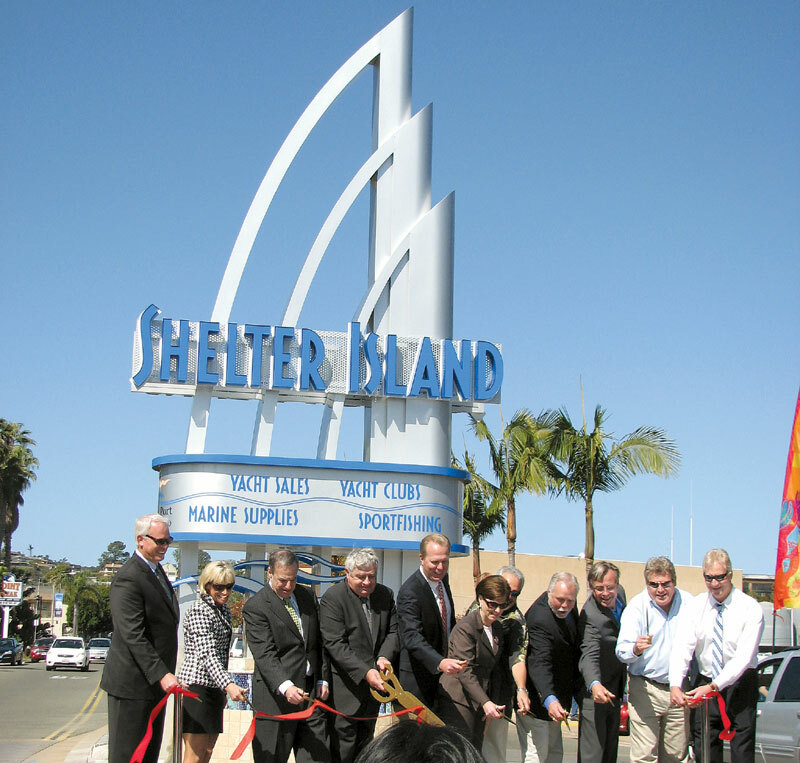 SAN DIEGO — San Diego’s Shelter Island is home to numerous marine-related enterprises, and now many of those businesses will be listed on a 25-foot-tall sign located at the peninsula’s entrance at Shelter Island Drive and Anchorage Lane. The sign, built by Stanford Sign & Awning of Chula Vista, features three sails constructed from fabricated aluminum and includes travertine tile, a waterfall fountain and LED lighting. The sign will list businesses in the area including restaurants, hotels, yacht brokers, offices, marinas, boatyards, fishing clubs, sportfishing enterprises and retail shops. The creation of the sign was a collaboration between the Port of San Diego and its Shelter Island tenant businesses. In the 1970s, an entry sign and an iconic entryway sail sculpture were planned for Shelter Island’s roundabout on Shelter Island Drive. While the sign was completed in 1984, the sculpture was never constructed. In 2007, Port of San Diego officials and Shelter Island tenants set out to create a new sign design that would call attention to Shelter Island and its businesses, as the old sign’s location at the center of Shelter Island was not as highly visible as the Shelter Island Drive, Anchorage Lane median spot. The port issued a Request for Proposals in January 2010 and moved forward with the project. The total cost for the new sign is $113,000, paid for by the Port of San Diego’s major maintenance budget and financed by rents from Port Tenants Association members.